By now, you've probably read the story or heard about what happened. And if you haven't, there are versions on both EVE News 24 and TMC. As always, I'll start with a short version of events but I really kinda want to talk about the bigger picture, too. On Sunday night, BandWidthh, a six-month member of Habitual Euthanasia (one of Pandemic Legion's most celebrated corps) declared on comms that he was aware of two carriers repping an off-line POS. He spun up his own super-carrier and asked for additional supers to get into fleet to help him destroy these two hapless victims. 13 PL players joined him, one of them in one of the game's three Revenant super-carriers. BandWidthh had a mid-point cyno set up and jumped the supers to this mid-point, then once the fleet was capped up, informed them that the carriers were tackled and they were clear to jump through. They jumped through to an off-line POS, all right. But there were a few dozen Black Legion supers, 50-odd Black Legion dreadnoughts, and a large support fleet waiting for them. Due to a minor mistake and three of the supers bumping off the off-lined POS, these three supers were able to successfully get away. The remaining ten supers, including the Revenant, were destroyed. In short, BandWidthh inflicted an awox on Pandemic Legion worth some 700 billion ISK. The Revenant hull alone had been sold to the pilot for 290 billion. BandWidthh claims not to have joined PL with this intent in mind. In fact, for all intents and purposes, he claims to have been goaded into the action through peer pressure. The PL derp is making Pandemic Legion famous across the Internet. The Forbes video game writer covered it, as did this gaming website. So, you know, word's getting around. This is going to be one of those stories that causes people to start playing the game. Somewhere out there is a frail young EVE newbie reading one of these articles and dreaming of the day that he too can lure a 300 billion ISK ship to an untimely and amusing death. Nearly as amusing as the awox itself is the reaction afterward, which is captured on a pair of Soundclouds (here and here). The... ummm... angry person is Grath Telkin. The much more relaxed voice belongs to JEFFRAIDER. Both are long time Pandemic Legion members and respected for their respective skills within the alliance. If you've ever come up against Pandemic Legion and came out on the losing side, I do recommend taking 20 minutes or so out of your day and listening to the recording. 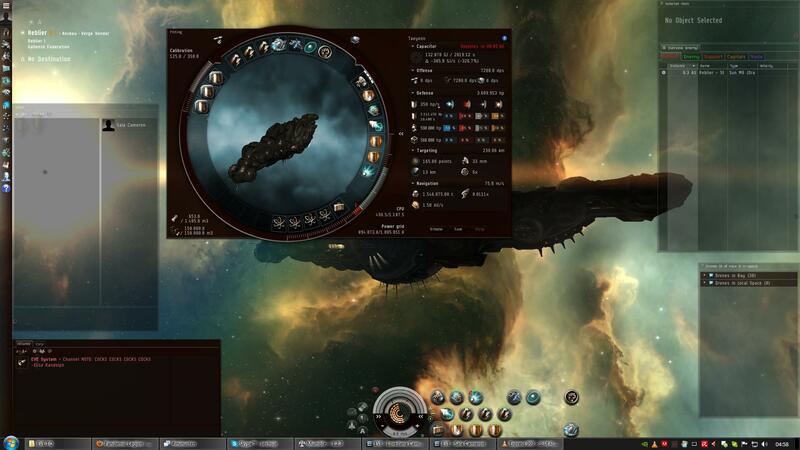 It is some of the most beautiful rage in the history of EVE Online. It will not be long until it is parodied and satirized across Youtube, if it hasn't happened already. It's certainly started generating some amusing pictures, this one and this one being good examples. The latter is a reference to the Grath screaming on Teamspeak that "WE HAVE! TWELVE! BLACK LEGION SPIES!" But it's also interesting to consider what it all means. I myself have had three particularly memorable run-ins with Pandemic Legion, one every year or so for the last three years. In 2010, Pandemic Legion was instrumental in kicking Gentlemen's Club out of Scalding Pass. I was in a number of fleet engagements with them during that time, and we won very few of those. In 2011, Pandemic Legion made a concerted effort to conquer a number of technetium moons in the Pure Blind and surrounding regions and were repulsed by a small group of Pure Blind-based alliances, of which LAWN was one. I was part of the LAWN fleet for a number of fights (I blogged about them at the time), and we were successful in driving PL off. And last year, Rote Kapelle defeated Pandemic Legion in a "must win or die" Alliance Tournament match. I include this one with the other two because our AT team spent a week agonizing how we were going to approach that match and to me that week and the culminating fight at the end of it was every bit as memorable as the other two events that lasted much longer. And of course, I've had other more minor less memorable run-ins with PL over the years, too. In any PvP alliance, you have a percentage of professional pilots, those who really think about how they fly and how they fit their ships... and you have a percentage of F1-pushers who do what they're told. For much of its history, PL has been remarkable for the high percentage of the former within their alliance. Hell, for a lot of their history, they haven't been a "legion" at all. A classic Roman legion was 4500 men and PL was rather remarkable for how relatively small they were compared to what they could get done and who they could threaten. When I encountered them in 2010, they had about a thousand pilots, far fewer than Gentlemen's Club at the time. In 2011, they had 1500. And the vast majority of them were pretty scary individuals. This comes up again and again in Grath's rant. He talks about a full 40 seconds of silence when the trap was sprung on PL where no or few targets were called and there was little or no conversation at all, an absolute eternity in PvP time. Grath screams that someone should have been calling targets or at least directing the escape attempt, though the wording he uses is quite a bit more profane and insulting than that... it's the source of this blog post's title, in fact. ;-) He screams that the pilots involved didn't think about what they were doing. At another point, he screams that there's a disease destroying the alliance. "You weren't set up! You were stupid!" he practically shrieks at yet another point. Pandemic Legion is approaching legion-sized lately, now having well over 2000 members. It would not surprise me at all if we saw a pretty dramatic internal purge happen within the alliance at some point soon. While JEFF might be very casual about it, I can't imagine being a figure of fun to a large block of EVE players appeals to some of PL's leadership. PL is used to inflicting this kind of "user story" on EVE players, not being the subject of it themselves. Maybe the more relaxed people like JEFF will put the brakes on the situation? I listened to that sociopath. If someone raged at people, threatened to drive 12 blocks and assault someone, then made his racist comments on say, a TS server, and someone complained, CCP would move swiftly to remove that nutbar from the game. But because it is Grath, and it is PL, nothing will be done. Just as there is a double standard on the Eve forums for posting rules, (how many people flat out screamed incompetence and cheating in the server crash thread, how many attacked Decker in that thread) there is a double standard when it comes to this kind of audio thing. No the real double standard is people outside of hisec always being called sociopaths when you bears spew forth the most offensive crap and death threats every time somebody blows up your precious little afk-mobiles. I seem to recall someone in Texas, sitting naked and alone in solitary confinement. Perhaps he will be getting a neighbor. I'm sorry are you really raising this point? Someone talking about the events in a game should be banned from the game? If I made a comment in a pub 2 days later about the same thing I should be reported to CCP and removed from the game? What goes on in a private server is private. Yes he raged but did ANYONE THERE CARE? No. In fact they all found it hilarious. Stop pretend White Knighting to make a political point about "Evil Null Sec"
CCP clearly approves of racism, and threatening violence in their flagship product...where have you been? I listened to the rage, and I heard the 'n' word dropped, and someone referred to as a 'chink motherf****r'. So that is what being in an 'elite' EVE pvp alliance is all about? I think I'll pass. Oh dear gods guys... PLEASE do not feed the Troll... especially that one. Trust Kills… From all I have heard it seems that everyone involved just 'took the word' of this guy as to the tactical situation... IE no one double checked his intel, which was the key factor. Intel: get several sets of eyes in cloakies on grid and verify target(s) and other tactical aspects of the reported 'opportunity'. You fleet up and jump a Revenant into a Cap fight on the word of one guy alone... you "trust" one guy's word without verification... you get exactly what you deserve. That, for me is the scary part of this tale... not the loss, not the awoxing, but the TOTAL lack of proper redundant scouting and situational awareness involved. But, I live in holes... and I fight in holes, Lo and Null... and from comms & chat chatter I know we always have multiple scouts in the field. Trust, in EVE, kills Revenants. filling local with a bunch of neut/red scouts will often scare off your query, unlike in WHs. That said you want at least *A* scout (or better yet spy that's blue to the target) to verify. 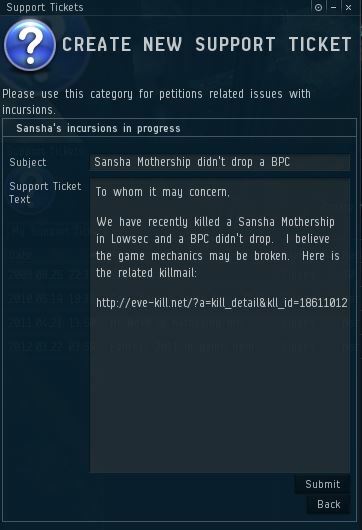 Oh... damn... Local... right... CCP really needs to get rid of that. I've been thinking that the 40 seconds of silence was due to the shocking realization that they had been trapped. Sometimes shock can overwhelm even the most professional people. As an aspiring FC I have the "Oh sh*t moments" all the dang time. >He talks about a full 40 seconds of silence when the trap was sprung on PL where no or few targets were called and there was little or no conversation at all, an absolute eternity in PvP time. John Boyd developed the concept of the OODA loop. OODA = Observe, Orient, Decide and Act. In his terms, Black Legion was "inside PL's OODA loop." Meaning that BL was able to act before PL was able to determine what was going on. >"We're an empire now, and when we act, we create our own reality. And while you're studying that reality -- judiciously, as you will -- we'll act again, creating other new realities, which you can study too, and that's how things will sort out. We're history's actors ... and you, all of you, will be left to just study what we do." In this case, Rove stated that he, and the rest of the Bush administration, were "inside the OODA loop" of the "reality based community." In the case of the US military, wargames are used to practice many of the situations so that when the bullets start flying, they have already practiced a number of the steps in OODA and thus can get to "act" faster than the other guy. As you pointed out, Pandemic Legion is used to being inside other people's OODA loop, and they don't like it when someone else is inside theirs. F1 pushers aren't bad if there is someone around to tell them what to do. Here the FC was the awoxer, there was no one to step up. Probably the fleet wasn't full of the brightest people of PL, I mean if you go out with a 300B ship to kill a carrier or two, you are surely not the brightest man of New Eden. The only fallout will be that they restrict which FCs are authorized to form supers, effectively ending small fleets of supers doing dumb things. A solo super loss won't make into the news, while properly lead super fleets won't die. First, it gives you both cap regen, AND a larger capacitor size -- when being heavily neuted, it takes them more cycles before you hit zero. Also, don't forget that supers can use each other to refit on the fly. Its a cap recharge travel fit, maybe even midway between some refitting. I sometimes wonder after reading your blog whether or not you are an author. You have such skill at getting your point across with clarity mixed with an excellent sense of humor. This blog is my voice of EvE, and you are to be commended for how excellent it is to read on a daily basis. 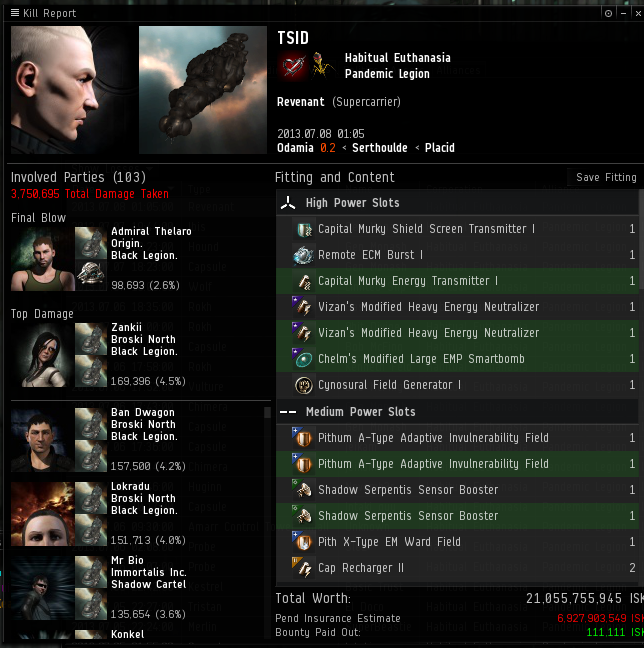 Also, I almost popped a 2 billion isk Tengu in your XLASB cyclone fit last night. My only gaffe was I mismanaged pulsing XLASB and also I forgot to put charges in my cargo hold so I couldn't reload. Blast! That being said, this report on null sec goings-on is riveting stuff. Keep it up! I agree with samuelthewriter. Your should seriously consider writing as a profession. Jester is an analyst. He writes for a living. More than that, it is his job to understand things and explain them to others for a living. Jester is indeed educational as well as entertaining. I rarely understand everything he writes about, but I read it all, and always am better informed afterward. There's another aspect here to all this - in that AWOX targets are rarely endgame content. The first half of the video is a reference to one of poe's lastest post (9th july). The second half contrasts this to Grath's rage. Being parodied over your pvp loss by BNI? Glory is fading.